Even though Esoteric’s resplendent repackaging of retro progressive rock is occasionally prone to errors in artwork or sound quality, it must be said that they do a finer, more consistent job than anyone else in the market at bringing us sounds from the past. I would hope that one day they’d be able to package the whole of prog history this way, but that’s a rather flighty thought. 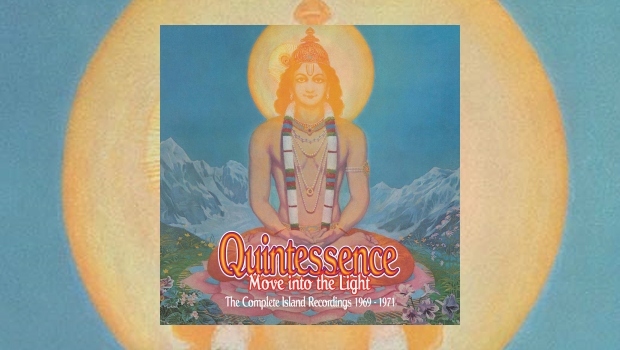 In the meantime, I’ve received the rather zeitgeisty Move Into The Light anthology that chronicles the first three albums by the turn-of-the-’70s hippies Quintessence; a band that tried even harder than The Beatles to make Indian influences in rock music fashionable and even enjoyable. To the unsuspecting listener, however, Quintessence can come as something of a culture shock. There’s a level of indecisiveness that pervades the first two albums, In Blissful Company and Quintessence, that can be rather off-putting. The band cannot work out if they want to go “full Indian” with actual mantras and chants such as Chant, Shiva’s Chant and Maha Mantra or “not really Indian at all” with psychedelic pop tracks like Notting Hill Gate. When they do decide the former route, however faithfully they reproduce the sounds of the East, it all feels a bit inauthentic; why would I listen to these guys when I could listen to real Indian musicians? This lack of direction leaves both albums feeling rather hodge-podge, casting a stain on the decent tracks present. Midnight Mode, for example, closing the first album is an innovative nine-minute blend of Indian chants, psychedelic jazz and finally an unwavering climactic drone. It’s an easy track to overlook, however, as there’s simply way too much going on in the other tracks on the album. There’s also a level of cheery spiritualism here that I cannot get on board with, although that ought to be expected from a band who begin an album with an exultant shout of “Jesus, Buddha, Moses, Guaranga!”. This may be linked to the turn of the ’70s perhaps, but it’s so earnest that it’s actually a little alienating. Surprisingly, a lot of these concerns are somewhat resolved by album number three, Dive Deep, coincidentally the first album where the band took the production away from their producer John Barham, a fact that the booklet essay by Malcolm Dome takes pains to make clear. Only six tracks take up the album’s forty-three minutes, and it’s apparent the band have matured considerably, honing their ideas into more distinctly impressive tracks. The spirituality is still there – check Sri Ram Chant – but the delivery is more sincere, and is sometimes even educational; Brahman introduces its title subject to the audience with sobering sincerity and striking lyrics set over a dark theme: “Everything is Brahman, even you are Brahman, even they are Brahman, even I am Brahman”. On the longer tracks, both Eastern and Western influences intertwine beautifully with long instrumental jams. It’s not the best prog you’ll hear from this period, but it’s a step in the right direction. In Dome’s liner notes, he mentions that In Blissful Company had the most expensive packaging of any Island album by that time. It’s not hard to see why; inside the gatefold LP was a full die-cut book of hypnotic art and lyrics. While the Esoteric booklet is not die-cut, they have made a pretty faithful rendition of the inner gatefold book, representing what the view through the holes of the pages would have looked like on the original edition. Pretty nifty! In fact, quite a lot of the album art from the original three albums is on display here, which is a lot considering that the inner sleeves would display art as well. The biggest omission, however, is the labyrinthine front cover art for Dive Deep, the best album of the set, and possibly the best artwork. It’s a terrible shame that it was missed altogether, but I’ve seen worse handling by Esoteric. The three albums come on two discs, with Quintessence split down the middle, along with a handful of bonus tracks to decorate the proceedings. What’s quite remarkable about progressive rock is the way that most of the music written nearly half a century ago can sound so fresh and original today. Surprising then that Quintessence sound just as dated as they come. While I can’t see that this anthology has any merit for the average prog listener, if a blend of Indian music and psychedelia music sounds good to you, you should definitely check set out. Meanwhile, I’ll go and listen to some krautrock.